-Passion for mobile devices and the iOS or Android platform. -For iOS: familiarity with Objective­C and Cocoa. -For Android: familiarity with Java and Android. -Interested in all things from visual and interaction design to building sleek UIs, working on back­end/API integrations, Bluetooth communications and everything else that will enable a world­ class experience for Tile users. In order to be considered for the internship, the applicant must also be pursuing at least a BS in a Computer Science related field. They also require strong programming fundamentals and excellent written and verbal communications. The company fosters a cooperative business environment, complete with loads of teamwork, team lunches, and company wide events. Onsite gym access is also a plus mentioned in the posting! This entry was posted in internships and tagged android, ios, mobile technology on March 29, 2016 by Joseph Philip Berube. All new RMU Mobile app! 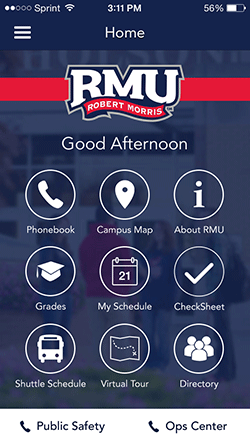 RMU Mobile is the all-new mobile app for Robert Morris University. RMU Mobile brings together all of the essential campus components of Robert Morris University into one app. From viewing today’s schedule, to calling a campus office, RMU mobile can do all that. Current students have access to several Sentry Secured Services features, such as Grades and My Schedule. Prospective students can view the Campus Map and learn more about our campus. In the My Schedule feature – students can view what’s on the agenda for the day and also view the semester schedule. 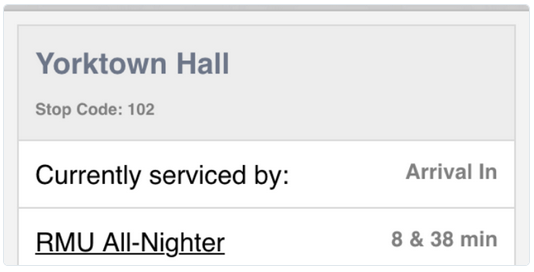 All the important campus numbers are available in Phonebook feature. Students can just simply tap and call any of the listed offices. Campus Map feature gives ability to take a “virtual” tour of the RMU Moon Campus and see where all the residence halls, classroom buildings, and various facilities are located. About RMU feature provides detailed and insightful information about the university. The Directory feature allows you to search all RMU Faculty & Staff members and get their contact information. Students are available to log in with Sentry Secured Services account to view all interim and final grades (once they’re posted), as well as the Academic Calendar and Checksheet. The app was also recently updated with a live shuttle schedule. Type in your location and the app will tell you how soon the next RMU shuttle will be there! RMU Mobile is available for both IOS and Android platforms and is dedicated to providing the best experience on the mobile device. You can also follow RMU Mobile Twitter account @RMUMobile – when new updates are available – you will be informed. This entry was posted in campus news and tagged academic calendar, android, checksheet, grades, ios, iphone, mobile app, RMU, RMUMobile, shuttle on November 25, 2014 by Lily Fedyk.